Keeping the BMW E92 M3 Cool With CSF Radiators! Although the BMW E92 M3 is a fantastic car, one of the best performance sedans made, it does have a few quirks. One of them, like most late model BMW’s, is that the car’s systems tend to run hot. Running hot on the track is one thing, but when you peruse user forums you find that for some drivers the cars can even run hot during street driving! Overheating seems to be an issue with many late model cars. New cars are designed to run hotter than older cars. Running hotter helps fuel economy and emissions. However, running hotter means that late model cars have less of a cushion between running hot and overheating due to thermal runaway. New cars have new performance technology, like the twin clutch, computer controlled 7-speed manual transmission in the E92 M3. The M3 shares this technology with cars like the EVO-X and the R35 GTR. Much like those two cars, the M3’s transmission is also plagued with overheating issues. When driving in traffic, if the driver rides the brake and the gas at the same time, it creates a lot of slippage and the transmission temps soar. The same goes for drag launches and during hot laps on the track. Although modern cars go into limp mode when the temps get too high, you can see that in the case of the M3, there are some extreme cases when the high temperatures have resulted in severe engine damage. 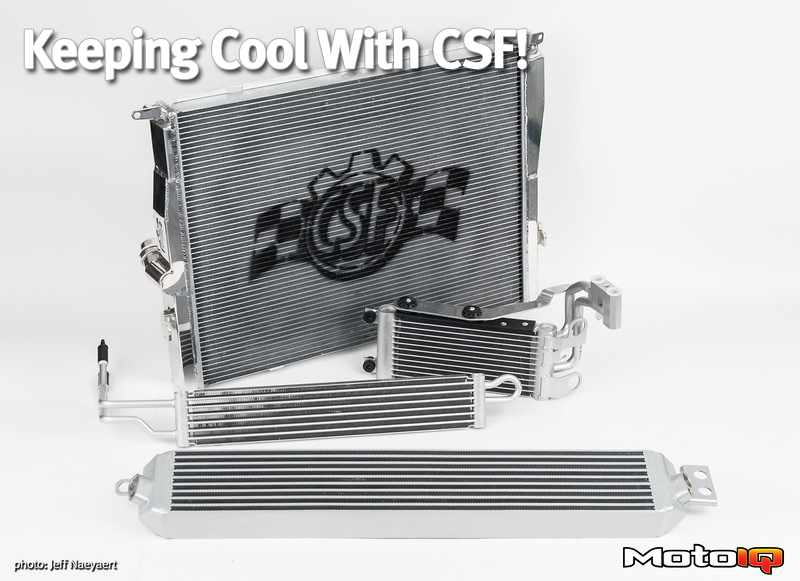 In hearing the complaints, performance radiator manufacturer CSF has responded in making a kit designed as the ultimate solution for fixing the M3’s temperature woes, a kit that upgrades every heat exchanger in the car with their performance parts. We decided to test the kit with the help of our friends at Pure Performance on an M3 in the middle of the summer heat. Does CSF’s kit help or cure the overheating? Read on and see! 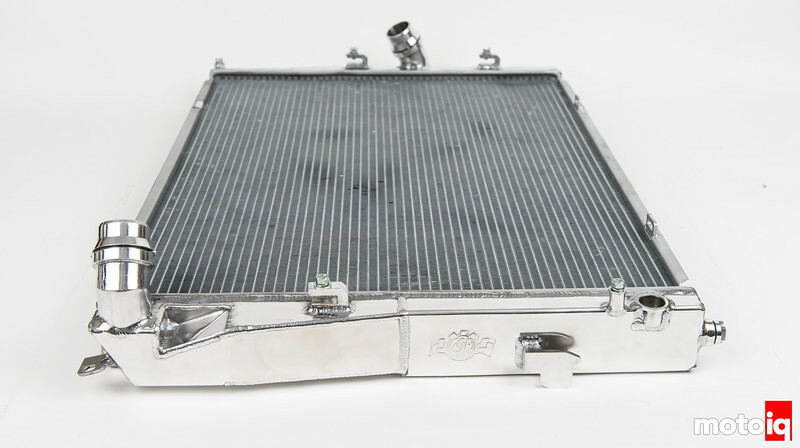 CSF’s performance radiator for the E92 M3 is an aluminum part that is TIG welded together. This replaces the OEM radiator that has crimped on plastic end tanks that can fail and spring leaks. The CSF radiator has all the correct OEM mounting tabs so it can fit in place of the stock radiator with no modification needed. It also has all of the correct mounting tabs for the OEM fan and fan shrouding. The CSF core has a 6.5mm multi louvered fin height which is a good density that has plenty of heat conducting area yet good airflow through the core. The CSF radiator is a triple pass design. This means that the fluid flow takes an S shaped path through the core going through it three times. You can tell by the welded in baffle halfway through the radiator tank seen here. A tripe pass core can improve efficiency as much as 20%. The CSF core is also quite different. Instead of having multiple rows of coolant passages going through the core, the CSF core uses CSF’s patented B tube technology. The B tube is a large but thin tube running the half of the 42mm width of the radiator’s core. There are two rows of B tubes in the core. This is sort of like the tubes found in an intercooler. The tube is extruded with a center divider which makes the tube look like like the letter B in the side profile. The divider serves to strengthen the tube from the effects of pressure and helps to conduct heat form the liquid coolant to the tube where it can be dispersed to the outside air. The B tube is superior for heat conduction and CSF radiators have performed exceedingly well in every test we have put them through so far! M3’s have unusual coolant hose ends that provide a positive and quick release connection to the radiator. This also means that any performance radiator company must either make some bespoke hose bibs on their offering or provide new standard type hoses. 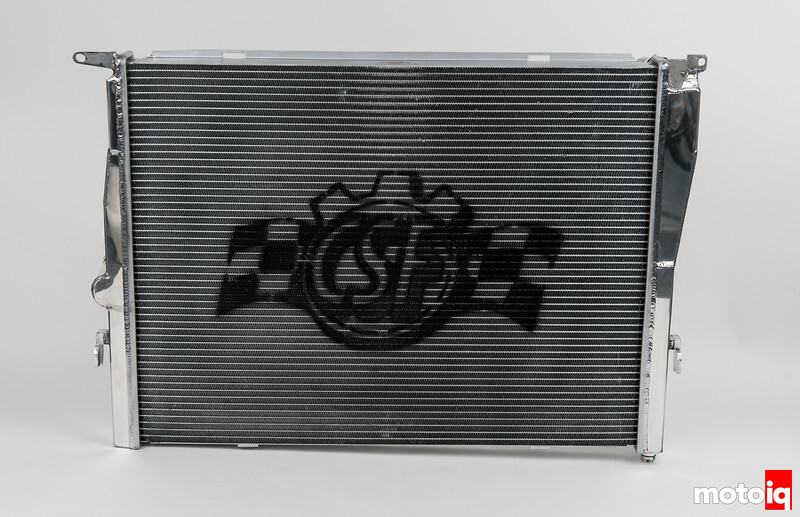 CSF did the harder but better thing and designed their radiator with with CNC machined hose bibs that mimic the OEM part so the OEM hoses can click right on! This is a really cool feature. 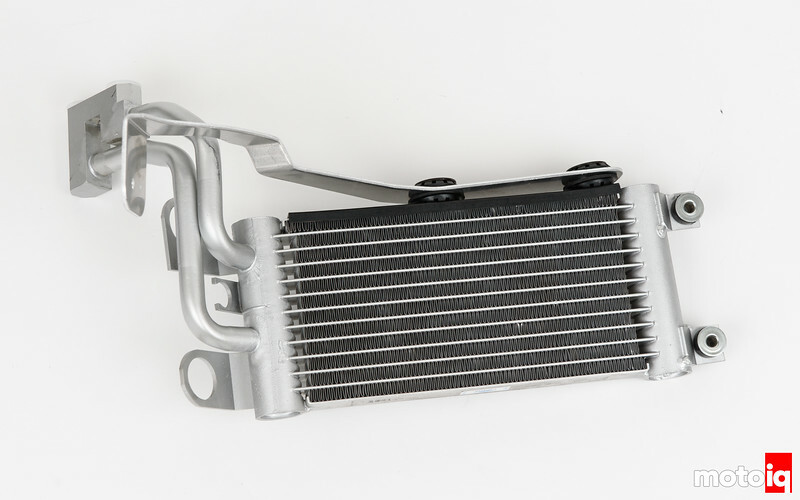 CSF’s transmission cooler is slightly thicker at 22mm than stock, has an extra set of cooling tubes, 11 cooling channels per tube, a better fin design with 20% more surface area and is a direct bolt on replacement of the stock cooler. The cooler has been lab tested to be 30% more efficient than stock. This is another specialized piece which requires a lot of work on CSF’s part because of the custom hard lines and block like hose attachments that seal to the OEM lines with O-rings. To replace this cleanly with typical race parts like AN fittings would require a bit of fabrication to redo the hose connections properly. 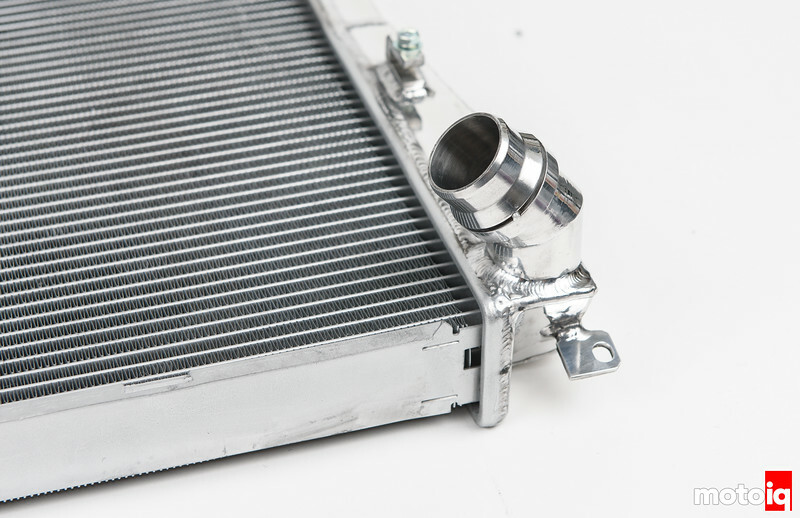 The oil cooler also has all of the mounting brackets to drop right into the stock location. This is all important because the M3 has excellent factory ductwork feeding air to the cooler and having the ability to reuse it helps the efficiency of the heat exchanger immensely.